Disneyland California Resort includes both Disneyland and Disney California Adventure. The information below applies to Disneyland tickets for both parks. Children under 3 get in free, and anyone 10 years old or older pays adult admission for Disneyland tickets. 1-Park Per Day Disneyland tickets are good for only one park. In other words, you can't visit Disneyland in the morning and Disney California Adventure in the afternoon of the same day, or vice versa. However, if you buy a multi-day ticket, you can visit a different park each day. Hopper Tickets allow you to visit both parks on the same day. Park Hopper Disneyland tickets expire 13 days after the first use, no matter how many days you buy. If you go to the Disneyland website to buy a Park Hopper, it's sold as an add-on. If you don't click it and pay the extra fee, you'll only be able to get into one park in a day. 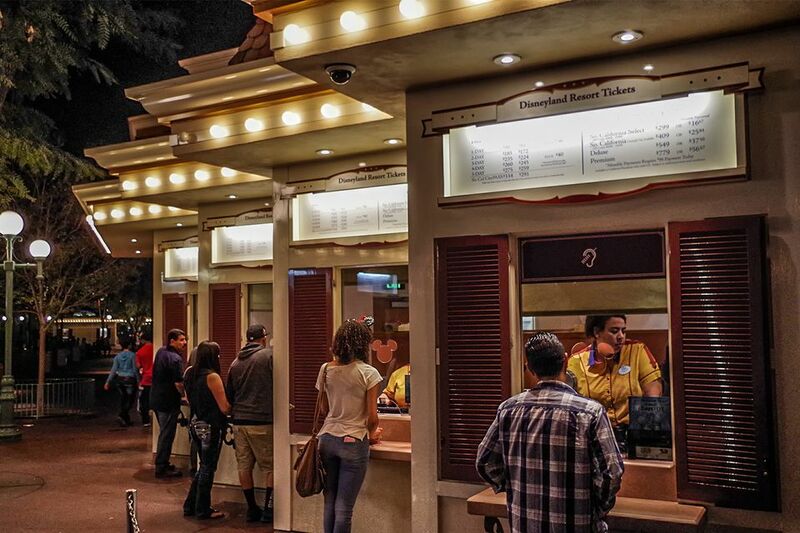 Get Disneyland tickets and stay out of line at the park. Order them online from Disney or you can buy them through the Disneyland app. If you buy from Disney, you can have paper tickets held at Will Call or mailed to your home. You'll pay a small fee for Will Call pickup or a shipping fee that varies depending on your location and lead time. These tickets come with a risk - they cannot be replaced if they're lost, even if you have a copy. Checked bags can go astray, so pack them in your carry-on luggage. A better option is to order online and opt for eTickets. You can print them at home and go straight to the gate. They will scan the e-ticket, and you will receive a standard Disneyland Resort theme park ticket for use over the duration of your visit. Buying online saves shipping costs, but even more important, an eTicket can be replaced if you forget or lose it, as long as the person who bought it is present and has the credit card they used to buy them. If that happens, just head for Guest Services at the Main Entrance Will Call window with the credit card and a photo ID and they can issue a new ticket. Buying Disneyland Tickets from a Mobile Device: You can buy your Disneyland tickets on your mobile device and have it scanned directly from the screen. You will not need to wait in line at Will Call or ticket purchase queues. Order by telephone at 714-781-4400. Once you start your Disneyland visit, lost tickets cannot be replaced, even if you have a copy of them. Keep them safely tucked into a secure pocket while you're in the park (we like to use a lanyard for this). Unlike other theme parks, Disneyland offers few discounts on tickets. The best way to save money on Disneyland tickets is to spend less time there or make your one-day visit on a Value day, but our guide to getting Disneyland tickets at a discount summarizes all the ways you can get your Disneyland tickets without paying full price. List prices for Disneyland tickets listed below are accurate as of January 30, 2019, and valid through December 31, 2019, according to the Disneyland website. However, that doesn't mean the prices won't go up sooner than that. You can order any of these tickets online through Disney's website. The price of a one-day ticket varies by the date you go (not the date you buy them). You can see the pricing calendar for the next few months at the Disneyland website. Getting the most out of these one-day tickets requires planning. If you go on a Value pricing day, you can save a lot of money. But if your plans change to a day with Regular or Peak pricing, you'll have to pay the difference at the gate. You can use a higher-priced ticket on a lower-priced day but you can't get a refund for the difference in price. One-day tickets must be used by December 30, 2020. If you let them expire, you can apply the purchase price to a new ticket, but you won't get money back if the new ticket costs less than the original. Value ticket days are the times when Disneyland is the least busy (weekdays off season). Regular ticket days are for days that are moderately busy and may include some weekends off-season. Peak ticket days are busiest times of the year, which include all holiday weekends, spring break, summer vacation season, and the entire week of major holidays like July 4, Thanksgiving week and the last couple of weeks of December. Multi-day tickets have different terms than one-day They expire 13 days after their first use or on January 12, 2021. When you buy a Disneyland ticket, it will have an expiration date printed on the back. It will say something like "not valid after 3/1." In case that seems confusing, here's how it works. You can use that ticket up to and including 3/1 but not after that. You don't have to use your multi-day tickets on consecutive days, but there are limits. They must be used within 13 days of first. After that, even if you have days left, you can't use them. For multi-day tickets, a "day of use" means you entered, even if you only stayed for a few minutes. Prices are the same for adults and children older than age three. Children under three get in free. If you want to get an annual pass, you can purchase them only from Disneyland, either through the Disney website or by upgrading while you're there.